*	substructural subsystems of N4, such as paraconsistent intuitionistic linear logics, paraconsistent logics based on involutive quantales, and paraconsistent Lambek logics. 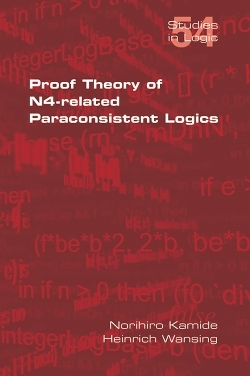 Although the proof-theory of N4 and N4-related logics is the central theme of the present monograph, models and model-theoretic semantics also play an important role in the presentation. The relational, Kripke-style models that are dealt with provide a motivating and intuitively appealing insight into the logics with respect to which they are shown to be sound and complete. Nevertheless, the emphasis is on Gentzen-style proof systems - in particular sequent calculi of a standard and less standard kind - for paraconsistent logics, and cut-elimination and its consequences are a central topic throughout. A unifying element of the presentation is the repeated application of embedding theorems in order to transfer results from other logics such as intuitionistic logic to the paraconsistent case.